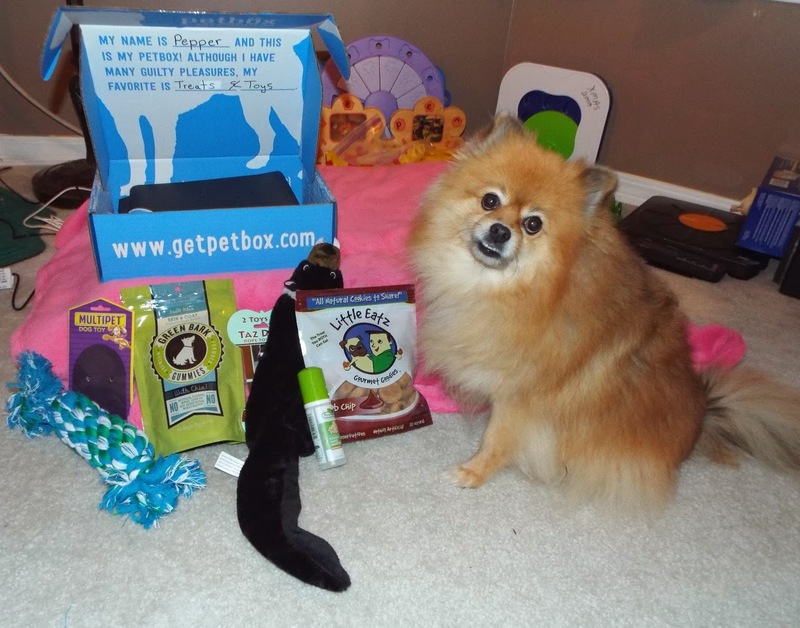 Do you know that there is a monthly pet subscription box that allows you to pick what goes inside? There is! It's called PetBox. It is really easy and fun to do. Plus, you know you want to bark at the mailman or delivery guy when he brings it. BOL! Like most curious dogs, I give all packages a sniff test when they enter my house. This box smells like it's for me, not for Mom. Let's look inside. See! I told you it was for me! 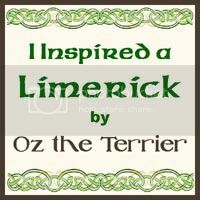 It's full of fun dog products. 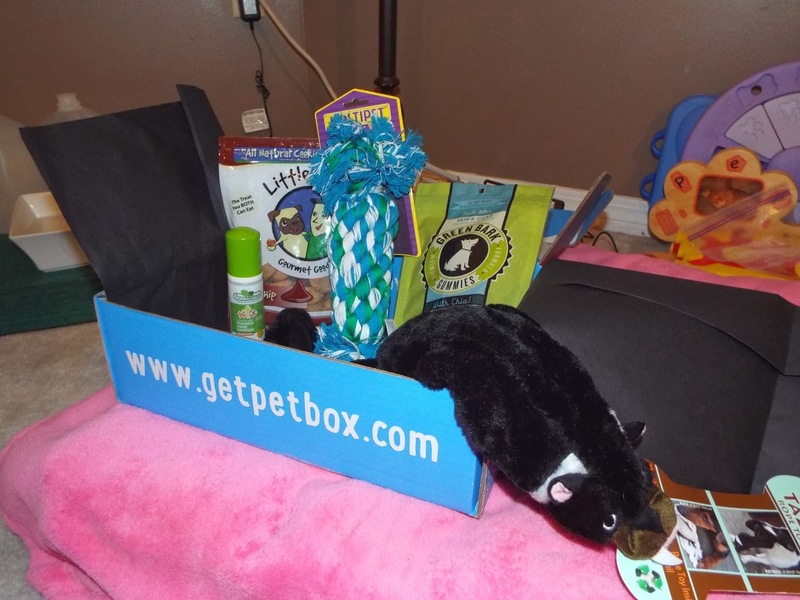 PetBox has 2 options, pack your own box, or let them pack it with surprises. I wanted to choose my items, so I selected the pack it myself option. 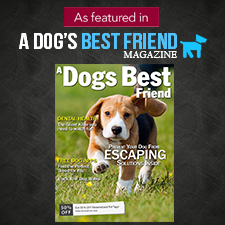 This is a pawfect solution for dogs with allergies who still want to receive a monthly box. Since you pick the treats yourself, you can avoid the ones you can't have. When you sign up and chose to pack your own box, you are given 6 points each month. Each product choice has a point value. Most items are 1 or 2 points, so you can choose up to 6 items. My box has 5 items because I chose one 2 point product. There is a large variety of products to choose from. I chose 2 treats, 2 toys, and one accessory item. There isn't a set shipping date, your box ships a few days after you order it. 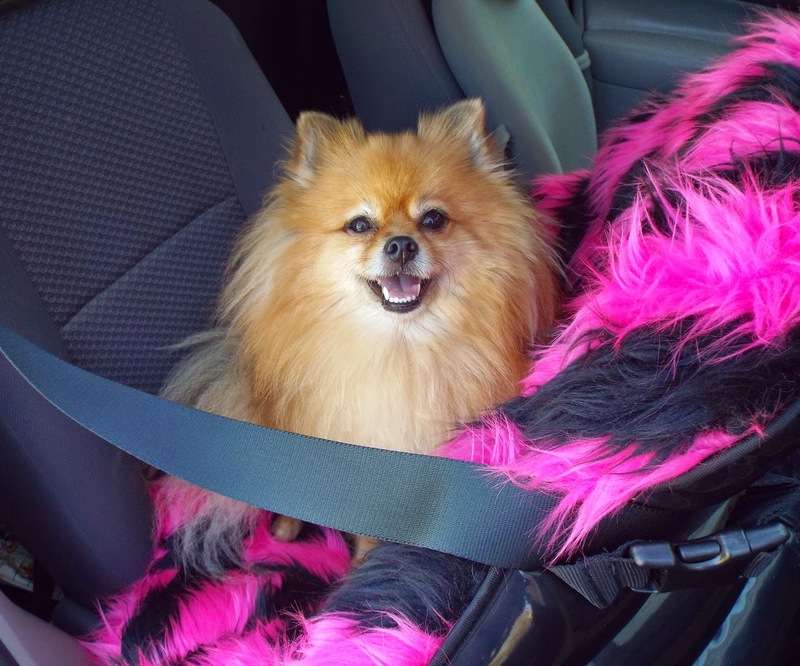 The pack it yourself option is also great for dogs who need certain kinds of toys. You can pick tougher toys for dogs who destroy plush toys, or plush toys for gentle dogs like me who enjoy a good squeaky! I chose one plush toy, and one rope toy. I pulled that tazmanian devil out of the box as fast as I could. (He was the 2 point item I ordered.) The Aussie Naturals Tasmanian Devil toy has a rope inside (instead of stuffing), and 2 squeakers. It is 22 inches long and is pawsome for both fetch & tug. I like to roll over and wrestle with it. BOL!! The Multipet rope toy has a squeaker inside of it! It is fun for playing tug :) You can see it is a little bit thick for me to get my jaws around, but I can still latch on to it for tug. Mom ordered the medium size one, but she should have ordered the small size one. Mom picked the size by the length, and she didn't think about the width. She wanted one long enough so I wouldn't grab her fingers when I grabbed the toy. Guess what I found in the PetBox treat selection. A cookie made for both humans and dogs to eat! Mom and I can share cookies now. She better not eat all of them! You know I consider them to be MY cookies. BOL! These delicious cookies are called Little Eatz Gourmet Goodies. I chose the carob chip flavor. Mom says they taste like human chocolate chip cookies. Mom! Get your hands out of my cookies! I think I may have to fight Mom for MY cookies. BOL! Yes, I did lick the floor clean of every last crumb. BOL! Little Eatz are all natural and made in the USA. Ingredients: Unbleached Flour, Whole Oats, Sugar, Brown Sugar, Canola Oil, Carob Drops, Carob Powder, Soy Lecithin (an emulsifier), Water, Unsweetened Applesauce, Natural Flavor, and Salt. There are no Preservatives. My dissapearing gummy bear trick. Ta-Da! All gone. I ate him faster than the camera could click. BOL! Look at what I have. 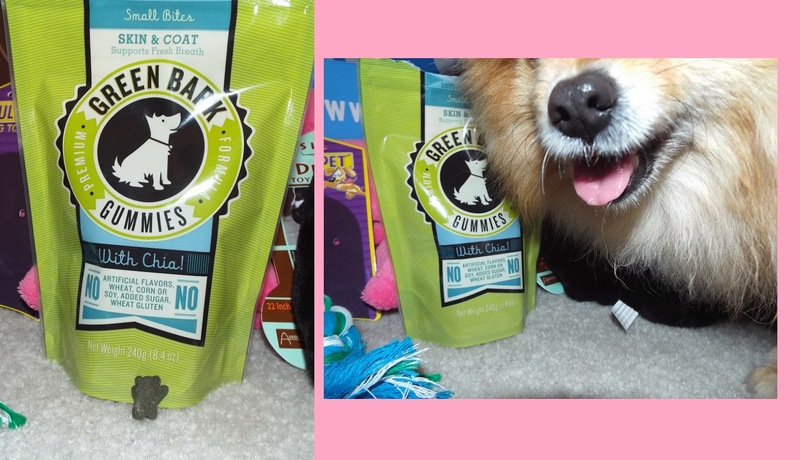 Green Bark Gummies, they are gummy bears for dogs! BOL! These yummy treats are a fun way to eat my supplements. 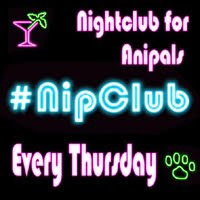 I have the Small Bites Skin & Coat formula. They full of healthy things like Omega 3, Chia seeds, and kelp. My favorite thing is the taste. They are made in the USA and they are very yummy! INGREDIENTS: White Fish, Tapioca Starch, Glycerin, Dried Ground Pea, Dried Ground Potato, Calcium Carbonate, Spray Dried Pork Broth, Fish Oil (preserved with Mixed Tocopherols), Dried Ground Chia Seed, Brewers Dried Yeast, Egg Whites, Maltodextrins, Salt, Phosphoric Acid, Natural Chicken Flavor, Glucono-delta-lactone, Dried Egg Product, Dried Ground Kelp, Dried Green Tea Extract, Garlic Powder, Ascorbic Acid, Dehydrated Alfalfa Meal, Sodium Copper Chlorophyllin (for color), Sorbic Acid (preservative), Calcium Propionate (preservative), Biotin, Citric Acid (preservative), Rosemary Extract. The last item in my PetBox is for Mom. It is tangerine scented hand sanitizer from PawGanics. Mom, like most humans, likes to clean her hands after bagging my poop. Obviously there are no sinks on our walks. BOL! 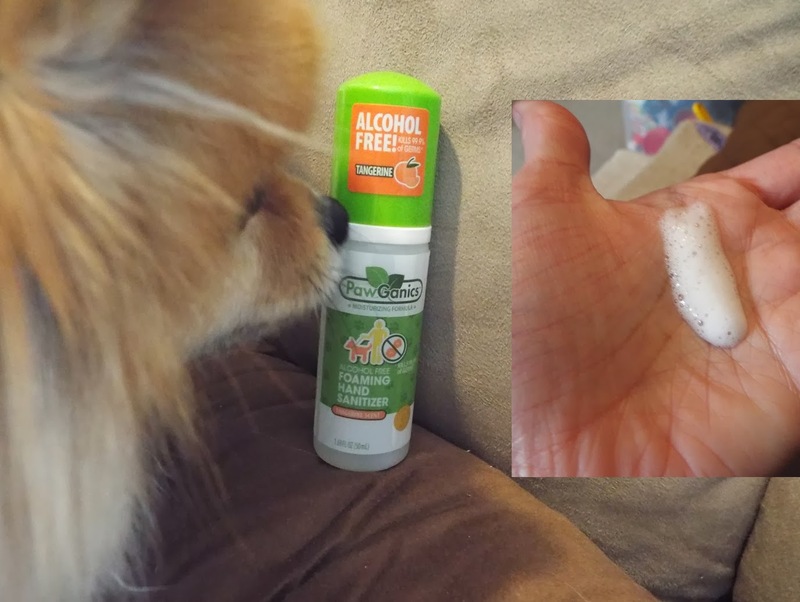 This pocket sized bottle of foaming hand sanitizer is exactly what Mom needs. It is Alcohol free, so it doesn't burn her dry skin. The tangerine scent is very light, so it won't bother people (like Mom) who are sensitive to strong perfume smells. Mom likes this hand sanitizer almost as much as she likes my Little Eatz cookies. BOL! 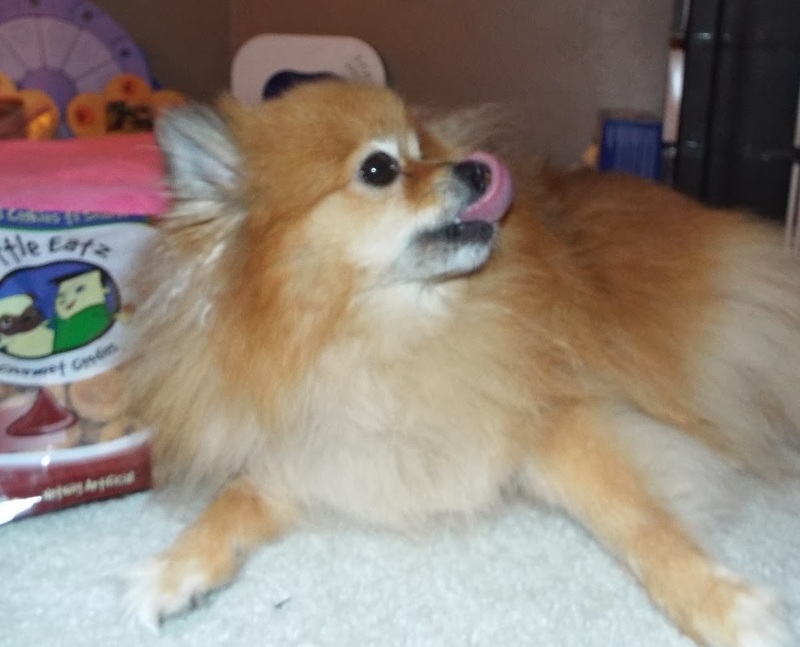 I bark that PetBox is a fun and delicious success! Wow, I thought I knew about everything, but this is a new one to me. I love how you can customize your own box and you sure did a great job of that, Pepper! 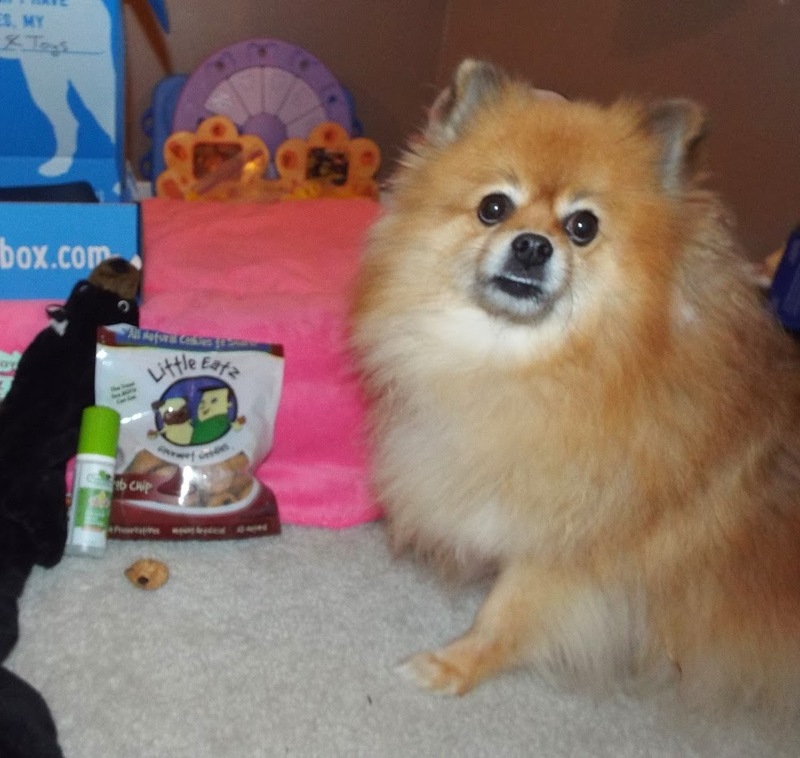 We love PetBox Pepper! I wonder if Shiner will get any of these things in her next box. Ours is a surprise and we can't wait for it to come. We got a PetBox in December. Looks like you chose some fun stuff! It's like Christmas for Pepper every time she gets the box. So many goodies! Hi Pepper! What a cool way to celebrate your Birfday!